Rare is the yacht building news coming from South Korea, and we're happy to announce the launch in early July of the first 24m-plus motor yacht built by GHI Yachts, now ready for delivery. The first hull of the Express 80 EC series, this 24.38m motor yacht is entirely built in aluminium with a naval architecture by Francesco Rogantin and an exterior design by Andrea Borzelli. Designed for performance, her deep-V hull allows a top speed of 30 knots, thanks to twin Caterpillar C-32 engines. This model has an enclosed flybridge dedicated to the wheelhouse, but a version with a standard sun deck is also available. The contemporary interior accommodates eight guests in a full-beam master, a VIP and two twin. 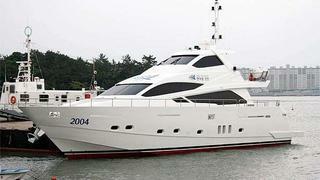 The first Express 80 EC motor yacht is now ready to be delivered.